6 Black Friday Travel Deals at All-Inclusive Palace Resorts – Save up to 60%! Enjoy these all-inclusive Black Friday sales we found for six Palace Resort locations that can sleep families of 5 or 6. Save up to 60% off! Book your next Caribbean retreat this Black Friday and enjoy doorbuster savings of up to 60%, plus receive up to $1,500 USD in Resort Credit to use towards lavish spa treatments, world-class dining, exotic tours, and much more. 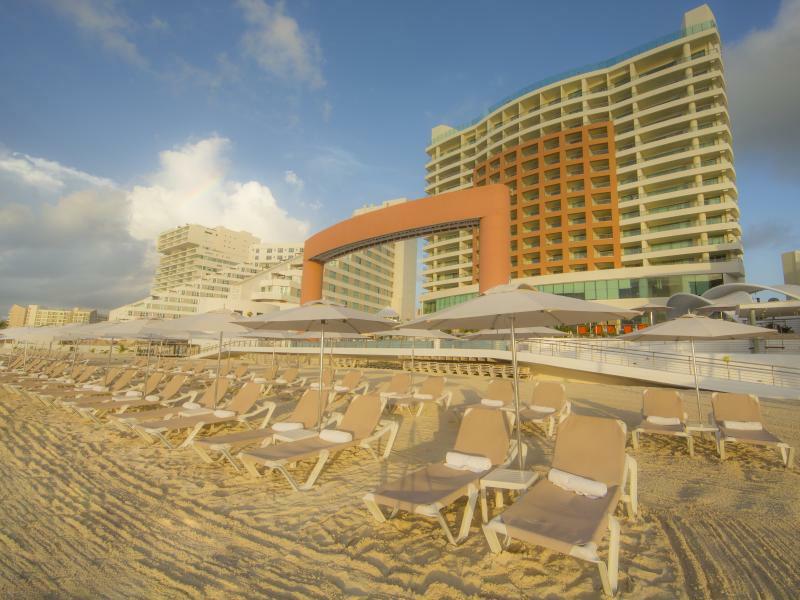 Discover endless activities, ultimate relaxation, and first-class services at Beach Palace all-inclusive luxury resort, located directly on the beach in Cancun’s hotel zone, moments from area attractions, historical sites and more. A vast stretch of sandy white beaches and blue ocean waters welcome you as you make your way to the beach area. Begin the day at the family-friendly Beach Palace with a delicious meal from one of the 4 on-site restaurants. Spend the afternoon relaxing by one of 3 swimming pools or at the full-service spa. Relax at the end of the day in spacious accommodations, furnished with private balconies. Families of 6 can book the Family Deluxe suite with 2 connecting Superior Deluxe – Lagoon View rooms. One room with a king bed and connecting rooms with two double beds. Two Bedroom Presidential Suite offers luxurious rooms to sleep six with 1 Bedroom w/king size bed & private bath w/ shower only and a 1 Bedroom w/double beds. Dive into the luxury of Cozumel Palace, the best all-inclusive resort in Cozumel for families, couples, and a heaven for divers. If water sports are your passion, you will love everything Cozumel Palace has to offer. Head out for a SCUBA dive, or snorkel right off our dock. This all-inclusive resort features an exceptional oceanfront location, complete with an endless number of family-friendly activities as well as relaxing spa treatments, and is only moments from popular area sites. Start the day with a delicious meal from one of Cozumel Palace’s 4 on-site restaurants. Spend the afternoon by one of the resort’s swimming pools, or take advantage of daily organized activities. Loft Suites- Families of 5 or 6 can enjoy two levels of boundless luxury with a Loft Suite. The lower level boasts a bedroom with a king-sized bed, double whirlpool tub and private bath with shower. The upper level features a with a bedroom with double beds, a private bath with shower. Step out on the balcony and ease into the hammock to enjoying the breeze in from the ocean, or lounge around in the living room. All located on the first floor. Presidential Suite – Luxury awaits you in this two-bedroom ocean-view oasis. Unwind in your own double whirlpool tub or admire glistening views of the Caribbean while lounging on the terrace chaise. When it comes to dining in, guests can request 24-hour room service, including special menu items from our restaurants’ gourmet options. Located in Playa del Carmen’s Hotel Zone, Playacar Palace all-inclusive resort offers luxurious guestrooms, relaxing facilities, and first-rate services for an unforgettable vacation in the Riviera Maya. The resort offers a beautiful outdoor pool with a swim-up bar. Guests can explore nearby archaeological sites on a guided tour right from the hotel, then enjoy nightly entertainment. After a busy day, guests can relax in a guest room at the Palace Playacar that offers a flat-screen LCD TV and fully stocked mini-bar. Guests will also enjoy upscale bath amenities, bathrobes, and slippers as well as 24-hour room service and turndown service. Presidential Suite – Families of 5 or 6 can experience the utmost in luxury in this elegant two-bedroom suite. Guests can take in glistening views of the Caribbean from the private terrace and enjoy a relaxing soak in the in-room double whirlpool tub. Order anything you desire from 24-hour room service, including special menu items from our restaurants’ gourmet options. Set in Cancún in the Quintana Roo Region, The Grand at Moon Palace All Inclusive features an outdoor pool and year-round outdoor pool. The resort has a children’s playground and a private beach area, and guests can enjoy a meal at the restaurant. Free WiFi is available throughout the property and free private parking is available on site. For kids of all ages, there are water park thrills and easy water play options. Float in a lazy river, splash in a wave pool and choose from a selection of different thrill-seeking slides. Presidential Suite – The Presidential Suites series is the hilt of extravagance and elegance. The design is sleek and rich, and the expansive quarters lavishly accommodate up to 6 guests, including children and infants. The spirit here is a “luxury resort within a luxury resort”. Grand Family Deluxe – Welcome to your family headquarters. You theoretically could have the time of your life not leaving the suite. Both kids’ and adults’ rooms are superior deluxe, each stocked with magical goodies. This suite is designed for up to 6 guests including children and infants. The Moon Palace Cancun – All Inclusive features 2 lagoon-style outdoor pools. Guest can dine at any of the 15 different restaurants and 12 bars. The resort also features a state-of-the-art gym and a children’s pool. Guests also enjoy a wave simulator. Transportation from the lobby to nearby Palace Resorts is available. Family Superior Deluxe – This guestroom sleeps families of 5 or 6. Bring the family, with these two connecting Superior Deluxe Garden view rooms. One room has a king bed, and the connecting room has two double beds and a fully stocked mini-bar offering Hershey’s milkshakes, juice, soda, water, and snacks. Both rooms boast a double whirlpool tub and welcome amenities for families. Presidential Suite – This luxurious suite sleeps families of 5 or 6. Guests will surely enjoy the in-room double whirlpool tub; the sleek dining and bar area stocked with world-class wines and spirits; and the lavish living room area replete with state-of-the-art technology and entertainment options. Outside this spacious private haven, guests will relish the majestic ocean view and a sweet breeze from their private balcony. Offering a spa and a swimming pool with a wave machine and water slides, Moon Palace Jamaica Grande – All Inclusive is located on the beachfront in Ocho Rios. The property has a dolphinarium where guests can swim with dolphins at an additional cost. At Moon Palace Jamaica Grande you can enjoy all-inclusive meals in the restaurants, as well as free snacks 24-hours a day. You will also find a tennis court, a fitness center, and water sports facilities. Rooms have full or partial views of the sea and offer satellite TV, air conditioning, a mini-bar, and a coffee machine. The private bathrooms come with a shower and bathrobes. Family Deluxe – Families of 5 or 6 will want to book the Family Deluxe suite which provides a higher standard of comfort and amenities for the entire family. The first bedroom features a king bed, while the second features two double beds. So Mom and Dad can enjoy a little privacy while still keeping the kids close. Ambassador Suite- The second you walk through the door, you’ll know you’ve arrived. Relax in your tastefully appointed living room, where comfort and luxury peacefully coexist. Check out the ocean views from your private balcony, before strolling into the bedroom. Enjoy a second private balcony off the bedroom, replete with hammocks for swaying in the gentle ocean breeze.